Seeing a line of pristine Carrera White Audi’s from across the paddock at Autobahn Country Club was almost enough to make a guy start jogging to get the first seat time. The brand-new S Q5 was on the pre-event list of attendees, and the new grille finish of the Q5 in brilliant white was very promising. 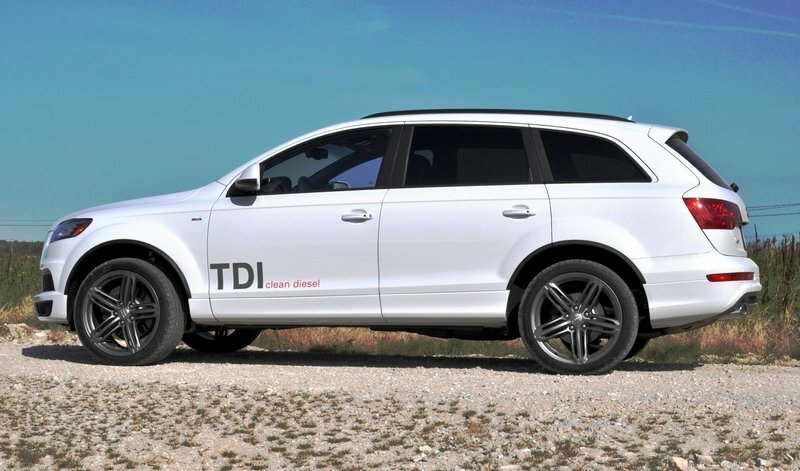 Within closer range, the “TDI clean diesel” script was visible on the side of almost all ten Audi’s on offer for the car writers to sample. The A7 and A8 were common sights leaving the club gates, but at least one car writer was mildly disappointed. 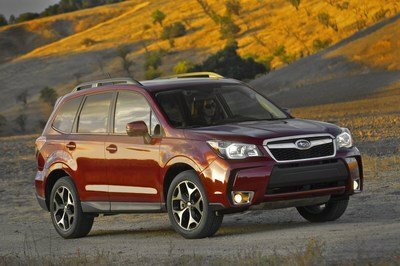 Not only was the S Q5 not present, but diesel engines all around? Eek. One bright spot was visible: a gigantic white Q7 with some snazzy fender flares on anthracite grey alloys. Also... a diesel, but this was more TopSpeed style. A quick blast up to my gravel road photo spot was enough time to fall head-over-heels for the big Q7, even as its replacement is firmly on the horizon for 2014 or 2015. 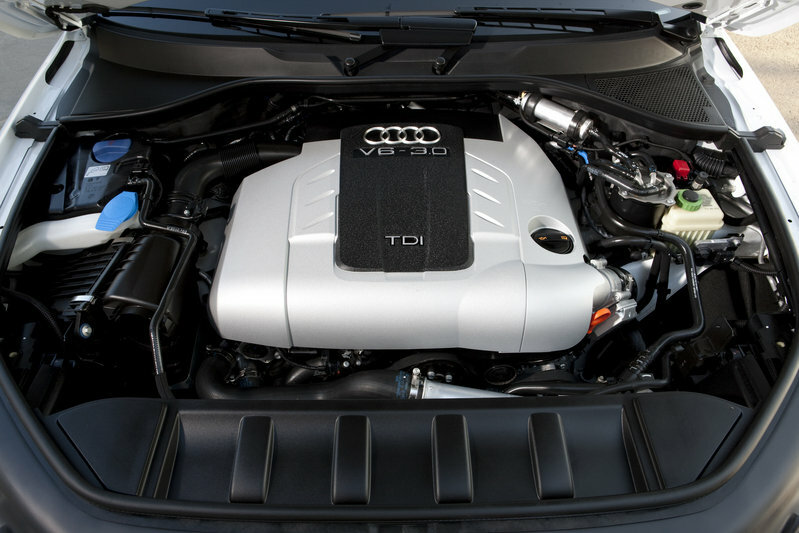 This Audi is a creamy beast with torque for days even in the 3.0-liter TDI specification. The real clue to its fresher-than-average looks is the S-line trim worn by the tester, which brings along a host of sporty programming options and décor inside as well. When a Cayenne is too bouncy, and an Escalade is too soft, look no farther than the Q7 TDI S-line for a seven seats and a ride that is ’juuusst riight’. 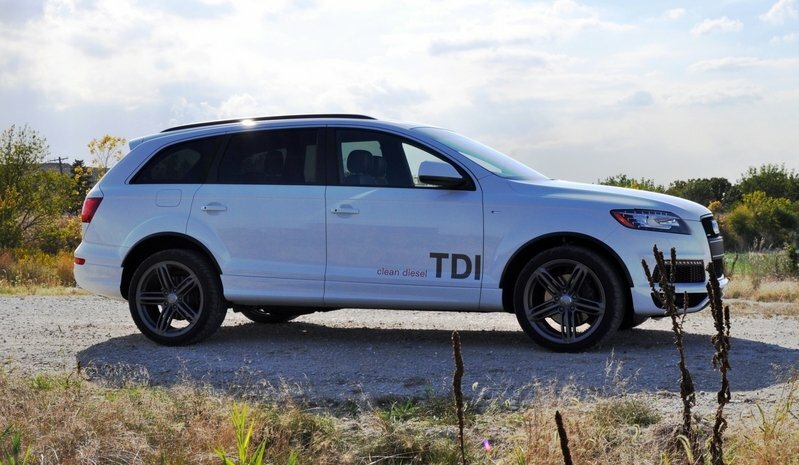 Click past the jump for all the beautiful sunny photos of the 2014 Audi Q7 TDI S-line, plus some first-hand observations on how the small-capacity diesel engine performs. 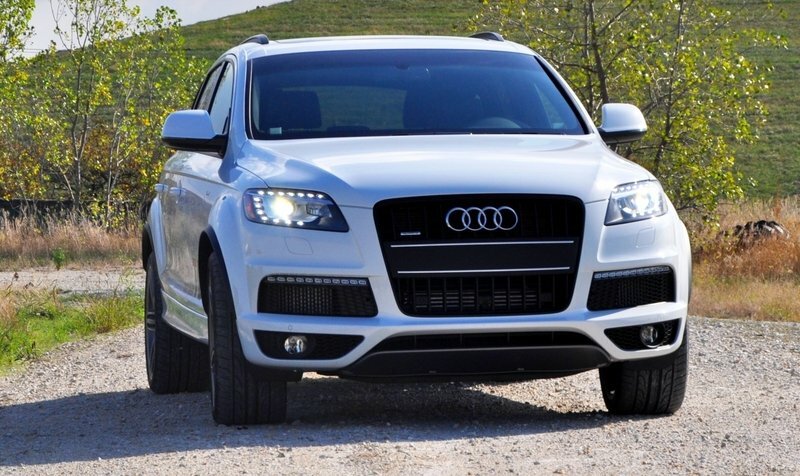 All the Q7 variations feature the must-have LED and xenon lighting as standard for 2014, with the extremely high-tech-looking lower blinker a sharp line of LEDs for the turn signals. The matte grey wheel and grille treatment is blended with more painted bodywork down low than seen on the cheaper Q7 models for 2014. 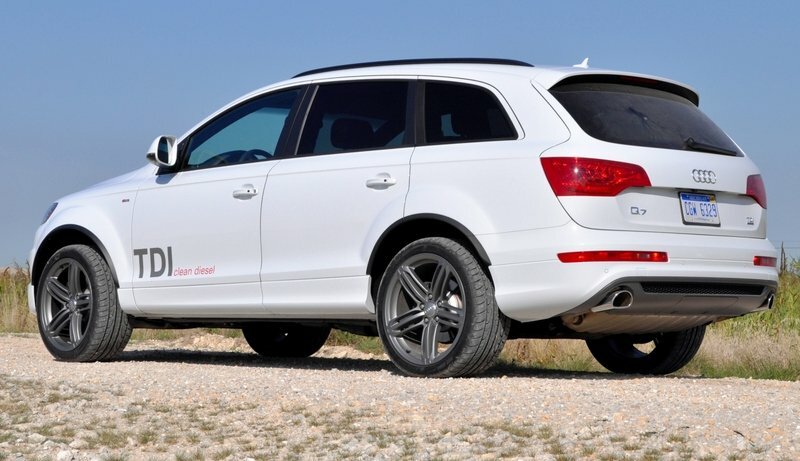 Slight sill extensions come with the larger wheels, and are standard on the S-line with its huge and gorgeous alloys seeming just the right size to match the tires and fill the Q7’s alloys. 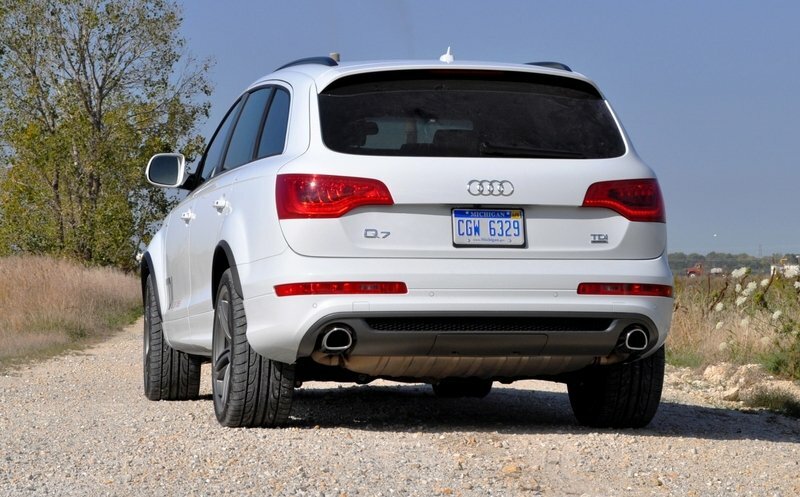 The Q7 S-line comes as standard with the otherwise-optional adaptive air suspension and a very sporty focus to all the bumpers and even the roof-mounted cargo rack. Everything is sleek and lean with the Q7 S-line in Carrera White, with the air suspensions’s kneel settings and adjustable ride height allowing for an even more tough and lowered appearance than shown in these photos at normal height. 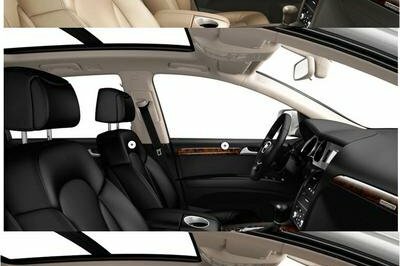 The Q7’s cabin feels exquisite, with all the classic Audi touches in the best places, like the stainless and alloy accents for the starter button, the pillow-soft and adjustable headrests, and an honest 70-plus cubic feet of cargo room with all the back seats down. 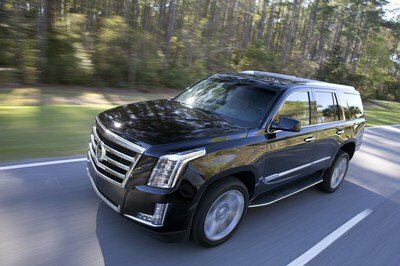 With the Escalade’s new fold-down seats, it is only about 20 cubic-feet larger in back than the nimble and posh Q7. The Q7 drives with a great lightness and nimble feeling from the steering at low speeds, which is remarkable on the 21-inch rims of the S-line trim. The diesel is absolutely silent, as was cirtually inaudible on the summer test day. 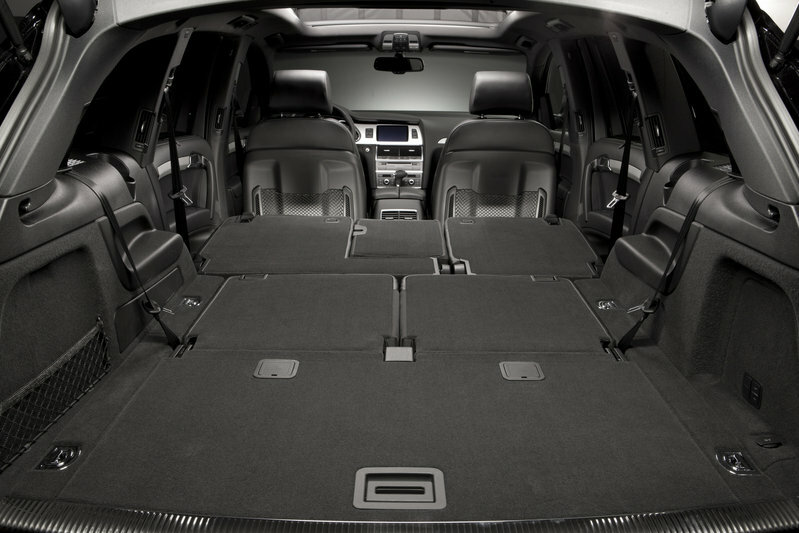 Colder weather may bring more gruffness than summertime, but the Q7 is exceptionally isolated and refined inside. 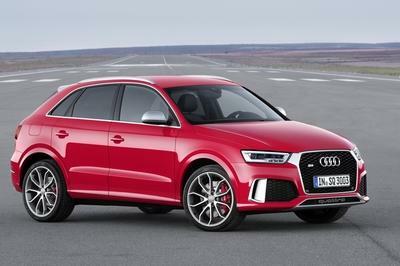 Power feels good and plentiful enough for Audi’s claimed 7.7 second sprint to 60 mph, but the top speed of 130 mph takes a large hit versus the previous 155-mph Q7 TDI V-12. Air suspension takes much of the kudos for the Q7’s beautiful slow-speed ride as well, with was - honestly - one of the smoothest of a day that also included the air-sprung Ram 1500 EcoDiesel and Mercedes-Benz E63 AMG. 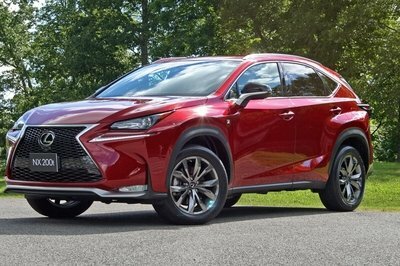 There really is no touching the smoothness of air springs versus even the latest magnetic and electronic active dampers. The Q7 displayed slight hesitation at step-off from a stop, but this is immediately gone with one of the Q7’s many dynamic settings. 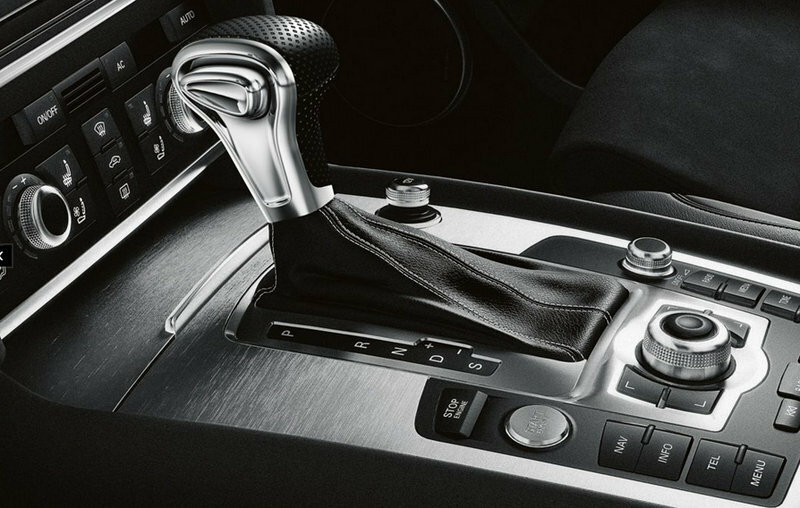 One piece of the Q7’s incredible engineering package that cannot go unsaid are its brakes. These are huge, firm under pressure, and halt the Q7 without any of the extreme nose squat that defines most Escalades and Range Rovers under heavy braking. 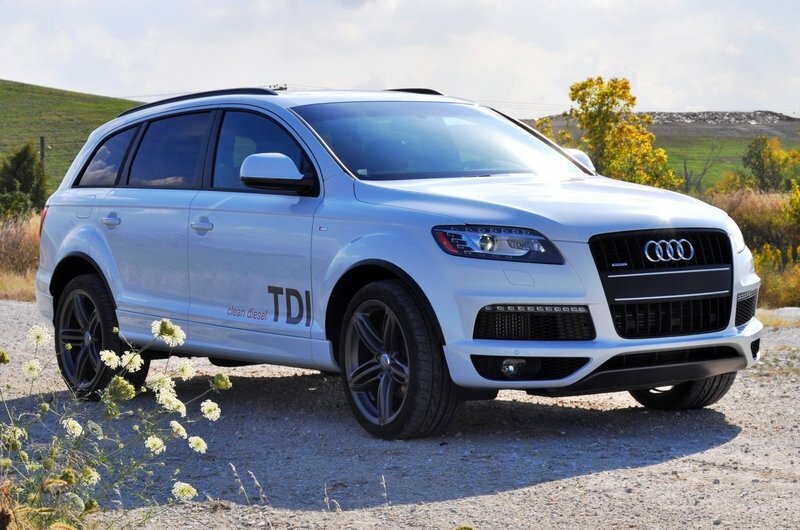 The Q7 TDI is available now nationwide from Audi dealers in a variety of flavors and prices. The tester’s TDI S-line trim is not yet on the price books, but is expected to come in a few thousand above the already-loaded $65,000 Q7 TDI Premium Prestige specification. 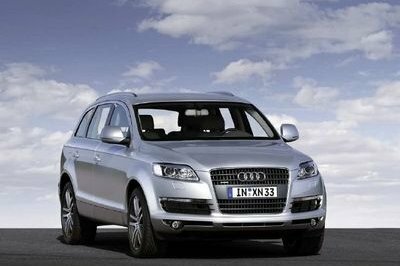 The gasoline-powered Q7 starts from just $48,000, which is great value versus the Buick Enclave and BMW X5. Among the Three Bears from the little storybook that is the Cayenne, Q7 and Touareg: Goldilocks would head right for the Q7. Not too soft, not too hard. But still looking cool and great to drive even with a replacement on the way.